At Home in War is the first of a series of events that will be put on by the Unley Library and the City of Unley in the near future commemorating the 100th anniversary of the first world war as announced by Mayor Lachlan Clyne. The City of Unley has a strong historical link to this war having lost over 30% of those from Unley who served. Unley was not alone of course. Australia indeed had the highest level of loss of life of all the countries to serve in this theatre of war. The exhibition focuses on life back home while our young men and women went oversees halfway around the word to fight for freedom. 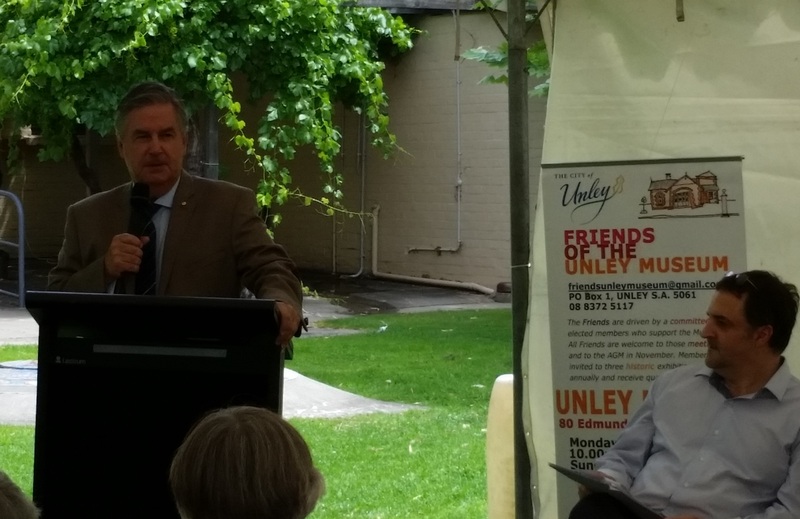 Rear Admiral Kevin Scarce opening At Home In war exhibition at the Unley Museum. The exhibition was opened by former Governor of SA Rear Admiral The Honourable Kevin Scarce. Held under a marquee in the village green this would be close to if not the best attended opening of the Museum I have attended since being on Council. It has been superbly put together under the leadership of Curator Elizabeth Hartnell by the volunteers at the Museum and they should be proud of what they have achieved. Many a storey is told in the exhibition re-creating what it was like at home in war 100 years ago. As I stood in front of the honour boards included in the exhibition and reflected on the grief and distress that would have been the prominent emotion of the day Reno Elms of Salvation Army Fame exchanged thoughts along similar lines. We recognised how families and communities across Australia were so devastated with the senseless loss of life of that era. Amazingly as I wrote that last paragraph (in the courtyard of the Church of St Augustine, adjacent the village green plaza) I was met by a man arriving early to participate in another event, the annual candle light memorial service at the Church for the victims of homicide. This in a graphic way bought home the grief of the loss of young people taken from us by man’s inhumanity toward man as he struggled with the loss of his 23 year old son, a murder victim. A day where I wearing two hats, as a Councillor of the City of Unley and a Warden of St Augustine’s, got the opportunity to recognize and empathize with those who have lost. Back to the Museum. I encourage you to take the opportunity to check out this exhibition. The Unley museum is located at the Old Unley Fire Station, 80 Edmund Avenue. It can be accessed from the Village Green.